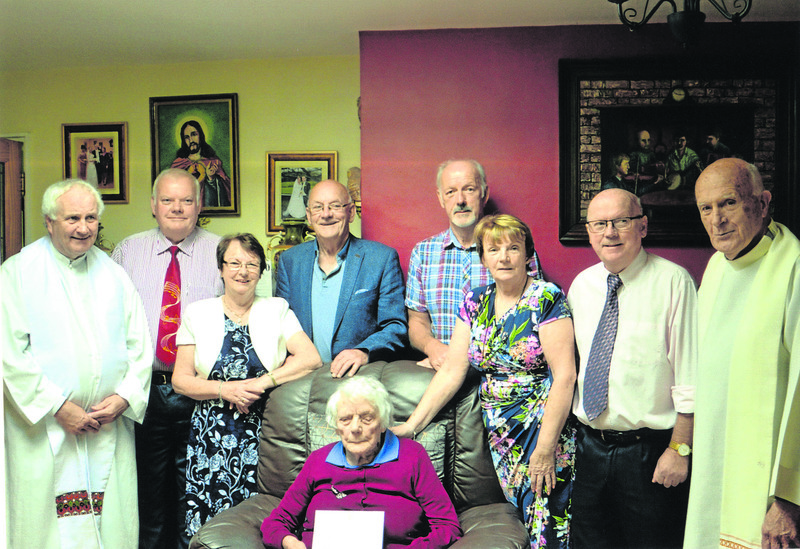 Congratulations to Mary O’Brien, Ballinla, Freemount, and Coolnagranagh, Coachford, who celebrated her 100th birthday last Sunday, 2nd September, in the presence of her family, neighbours and wide circle of friends. Mary, who was born Mary Gould in Dromina village in 1918, received her formal education at Dromina National School. Her first job was serving at ‘Paddy the Manager’s’ in Dromina. Later she married Denis O’Brien from Dromcollogher and they settled in Ballinla, Freemount. They were blessed with six wonderful children: Mary, Dan, Nancy, Jeremiah (Jerry), Jack and Denis. 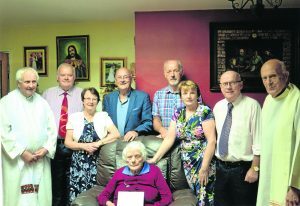 This family of O’Briens have contributed greatly to their respective parishes, have a great work ethic and show respect, loyalty, leadership and the dignity of work to all, an example they learnt in the home. Mary has always had a strong religious faith and her philosophy is that the glass is always half full. Mary continues to enjoy great health and reads the paper every day, listens to the radio and loves callers. She is full involved in the life of her family. Again Mary, we congratulate you on reaching 100 and wish you continued good health in the future, in the great care of your daughters Mary and Nancy and son in law Paddy. Since Mary Gould did come this way. And I’m so glad, she’s my mammy. To get bread and butter and a slice of ‘mate’. With Eugene O’Leary and poor John Copse. But fell in love with Dinny Brien. Who swept her clearly off her feet. Their finest son she called him Dan. That is why she called him Jer. So this is why she called her Nancy. Sometimes was a little fairy. So that is why she called him Denis. Who often got a thump in the back. While Danny Brien, the roads he tarred. No better lady there was to bake. To put that cheque upon her knee. You’ll mind your cheque, there is no fear.